This entire college basketball season, perhaps the most devoted reporter covering the St. John's basketball team has been Peter Robert Casey, who has been filing regular 140-word dispatches via his Twitter feed. What's interesting about Casey isn't that he's tweeting about the Red Storm: It's that he's doing it as a credentialed, press-row reporter. He's the world's first Twitter-exclusive college basketball sportswriter. With St. John's ending its regular season tonight and entering the Big East Tournament next week, we talked to Casey about how his experiment has gone, the disappointment of the St. John's season, and whether he'll do this again. Tell us about this project of covering the team via Twitter. What gave you this idea in the first place? The idea was actually conceived by the now-famous St. John's SID, Mark Fratto. I was going about my normal Twitter routine back in mid-August when I received a phone call from Mark asking me if I wanted to be a part of a bold new initiative that would, in a sense, validate social media. I knew college athletic departments were still averse to credentialing bloggers, but tweeters? This was clearly a well thought-out and strategic gate-jumping move that garnered a lot of late-summer headlines for a school that doesn't field a football program. As you well know, favorable headlines are valuable currency in New York City. I may be the "first media credentialed micro-blogger in college hoops history," but Mark Fratto deserves most of the credit. I'm a pioneer; he's an innovator. Is it strange? Do other media folk treat you different? Were you able to be credentialed for any road games? I do get some crazy looks from security guards and media members, alike. It comes with the territory. I was credentialed for four road games this season. I made the pilgrimage to Krzyzewskiville back in December and survived Cameron Indoor without a custom chant directed at me or body paint on the back of my sport coat. I also made jaunts to the XL Center (UConn) and Carrier Dome (Syracuse). Today, I'm headed to Chicago to cover the Johnnies' regular-season finale at DePaul. You have a relatively massive list of followers — 56,417 at last count. 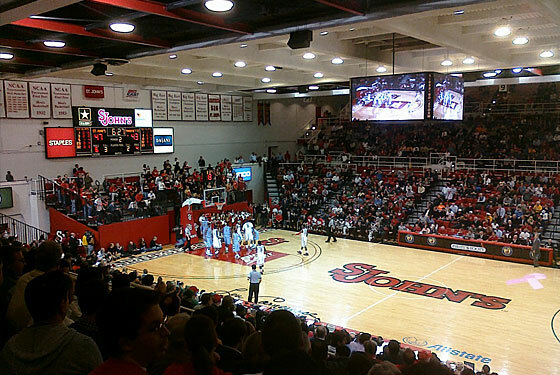 Are there that many people interested in St. John's basketball AND on Twitter? In 1985, yes, but that was before beepers were a popular technology. Generally speaking, the majority of people that follow me on Twitter are interested in basketball, social media, or both. The rest are spambots that send direct messages like "Vielen Dank für das weitere Folgen! Ich freue mich auf Ihre Fragen!" I'm also huge in Brazil, but I haven't figured out why yet. What do you do for a living? This? No, but I wouldn't be opposed to it. I actually ditched my day job (Student Affairs professional at Teachers College, Columbia University) this past January to work on a couple of start-up ventures. Hopefully, the world will be hearing more about those in June. They're basketball related. I also blog for The Huffington Post and discuss the interplay of basketball, social media, and marketing at PeterRobertCasey.com. Are you disappointed the season didn't turn out as well as people thought it would? It might have made for a bigger story, what you're doing. I feel for the players, fans, and the coaches. This team is loaded with experienced upperclassmen that had high expectations surrounding them before the season tipped off. They sported a 9–1 ledger through the first ten games and were receiving votes in both top 25 polls. The ensuing collapse and current third-tier standing in the Big East has to be a letdown for all of the team's stakeholders. I fared pretty well from the exposure: I was mentioned in the New York Times and on the web pages of ESPN, Sports Illustrated, Mashable, and the NCAA. Thanks to Dan Opallo and John Acunto at the NBA, I got the call-up to cover a Knicks-Clippers contest via Twitter. The Northeast Conference gave me a TV spot before the Wagner–Sacred Heart game and aired my Twitter handle throughout the game to drive conversations. I can't complain at all. Are you credentialed for the Big East Tournament? How do you think the Red Storm will do? I'm only guaranteed a seat when St. John's is playing. Otherwise, I'll have to dig into my pockets and sit with the rest of the tweeting public in the stands. I think the Johnnies are capable of escaping Tuesday with a "home court" win over a bottom eight team. I'm not too confident that we'll see them on Thursday, but you never know. Is Roberts gonna get fired? That's the $800,000 question. My 140-character or less opinion will not be weighed in the administration's decision. I'll leave that one up to them. Are you going to do this again next year? If I'm invited back, absolutely.